Antique Jewelry Case are undoubtedly a gorgeous and remarkable kind of jewelry cases. They offer a lovely and one of a kind design that will definitely attract everyone’s attention. They are ideal for stores looking to decorate their environment in a more antique reminiscent manner. They are surely the perfect choice for a more lush, rich and extravagant interior. They are often golden or silver colored, a token of opulence and great taste. They are gorgeous and outstanding without being kitsch. They provide a stunning and beautiful look of your items and they will surely embellish every environment they are placed in. Antique jewelry cases are a fine, delicate and splendid way of exhibiting all kinds of jewelry, they can easily display pairs of earrings, bracelets, tiaras, brooches or anything else in a way that will catch every customer’s or passer’s by eye and also beautify your window display case! Vintage Jewelry Case are a gorgeous, beautifully and intricately ornate type of jewelry display. They are ideal for anyone trying to achieve a more retro look in their store. They are all decorated in a precious and one of a kind manner, reminiscent of outdated fashion trends. They are often very colorful and they are available in all sorts of sizes and shapes. They are intended for the display of any kind of jewelry, earrings, rings, bracelets and many others. Vintage Jewelry Case are the perfect method of attracting your customers’ attention, therefore you can readily place them in your jewelry store’s window case. Moreover, not only do they make for efficient and enticing display cases, but they are also a genuine and splendid item of decoration as well! You can use them to exhibit items of jewelry or they can be simply used as decoration, given their wonderfully unique and opulent look and design! Personalized Jewelry Case are the best way of displaying various kinds of jewelry in a truly unique and beautiful manner! They are ideal if you intend to create a more authentic feel around your store. Personalized jewelry cases are beautifully individualized as they can either be custom made in order to fit a precise item of jewelry or they can contain your store’s initials, coat of arms, the brand’s name and so on and so forth. They present a lovely and interesting way of displaying your jewelry in a completely new and innovative manner. They obviously can be found in all shapes, sizes, colors and they can even be personalized with your name or you can have a special message engraved or embroidered upon them. Not only are they meant to display jewelry products in an attractive manner, but they will undoubtedly entice and appeal to anyone looking for a more one of a kind item as well! Modern Jewelry Case aim to achieve a fancy and elegant look and to display your jewelry products with style and in an interesting and innovative manner. Their modern design intends to offer new and captivating ways of displaying jewelry in order to create a long lasting impression. They can be square shaped, rectangular shaped and so on shape as modern trends have a tendency of going for geometrical shapes. They obviously come in various shades of colors. Modern Jewelry Cases reflect the surprising and striking trends of our nowadays fashion so they will also have more interesting and entertaining appearances. They will definitely attract plenty of attention towards the items they are displaying, therefore they are perfect for the display of jewelry in any jewelry store’s window case. 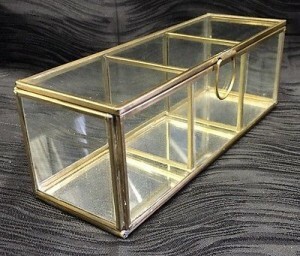 Modern Jewelry Cases offer a unique and completely new way of displaying jewelry while keeping their design as chic and fashionable as possible! Minimalist Jewelry Case is a special and gorgeous method of presenting items of jewelry. They offer a simplistic style that is ideal for stores going for a more modern or even futuristic look! They come in all shapes and sizes and they usually have a simple, non-intricate design. Their appearance is not abundant or too opulent, therefore avoiding the risk of looking too kitsch. They exhibit all kinds of jewelry, earrings, rings, brooches, bracelets, necklaces and so on. Minimalist jewelry cases are usually colored in one shade. Given their minimalist look, they can be easily placed everywhere as they will not clash with the decorating style. This kind of jewelry display is very elegant and it will definitely present all sorts of jewelry products in a lovely and appealing way. They are beautifully simplistic and they offer a certain kind of class and grace to the items they are displaying. Handmade Jewelry Cases are undoubtedly the best manner of displaying your products if you intend to go for a completely authentic and one of a kind look! All handmade jewelry cases are, obviously, created manually so each one of them bears their own token of originality and uniqueness. They all have their own special something and they are ideal for lovers of genuine looks! They are adorned with various kinds of trinkets and handmade details and they offer a dashing and fabulous look! Their sizes vary and they come in diverse colors. They can store all sorts of jewelry items. You can either place them in the window display case or have them beautifully arranged around the store for a better effect and a more attractive and DIY appearance! They are truly unique and lovely creations and they will surely display all your products in a gorgeous and appealing way! Horizontal Display Cases aim to display your items of jewelry in a horizontal method, as their name goes. Their horizontal look offers a better and more accurate way of displaying larger items of jewelry, such as necklaces or headdresses, tiaras and so on. They are usually cases with multiple shelves and they are more often than not completely see through to provide a better view. They come in various shapes and sizes so they will easily accommodate all sorts of jewerly, especially the more prominent ones. They can just as well be placed in the store’s window display or all around the store, on counters, vanities, dressing tables and so on. They provide a clear and accurate look at the size and wear of jewelry products, thus making them very efficient. Horizontal display cases are ideal if you need to display a larger sized piece of jewelry and they will surely prove to be very useful! 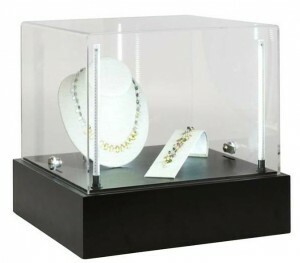 Museum Display Cases are a simple yet stylish and efficient method of presenting your jewelry before your customers. They are large rectangular or square boxes that are usually beautifully framed. They come in various sizes and they are generally completely see through for a better look and more accurate display of your items of jewelry. 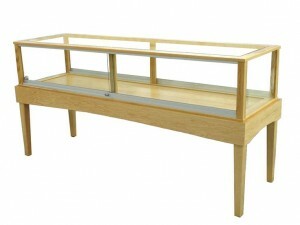 Their use is universal so you will be able to exhibit all sorts of jewelry items thanks to these museum display cases. Queen Anne Display Cases are a gorgeous and exquisite manner of displaying jewelry. They are a highly elegant and graceful item of decoration and they offer a truly beautiful and lovely display of your items. They are an antique item and they are filled with class and tradition. They feature a large cabinet supported on a set of beautifully curved legs. The cabinet is spacious and it is equipped with multiple shelves and they have a fully transparent show case. They are made of superior wood and they are crafted in beautiful and attractive designs. They are an astonishing creation and they will definitely embellish any environment they are placed in. 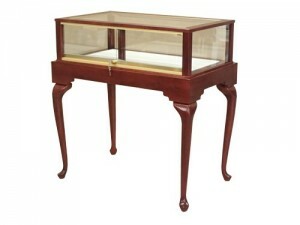 if you are looking for an elegant way of exhibiting your jewelry, queen Anne display cases are the perfect choice. They are graceful, chic, fashionable and they undoubtedly stand out everywhere you put then, be it in your store or in the window display.